An inside look at how beauty guru Bobbi Brown's stripped-down makeup philosophy translates into healthy organic eating at home. Every weekday morning, when Bobbi Brown arrives at the headquarters of Bobbi Brown Cosmetics in Manhattan's SoHo, she finds an egg-white-and-spinach omelet and a pitcher of water with lemon waiting on her desk. The makeup artist turned industry titan is so health-conscious that she has an approved menu of acceptable foods for meetings and celebrations that's constantly updated and sent around to employees. Right now the rule is that crudités, hard-boiled eggs, cheese or other wholesome alternatives must join any junk food on the conference table. "I don't care if there are cupcakes," Brown says. "But people have to have a choice." Brown, who is a slight and youthful 47, built her professional reputation on a "no-makeup makeup" aestheticfocusing on natural beauty, with a spectrum of basic shades meant to complement, rather than cover up, every complexion. This user-friendly attitude proved so successful that Brown sold the company to Estée Lauder in 1994, a mere three years after founding it, and maintains creative control. 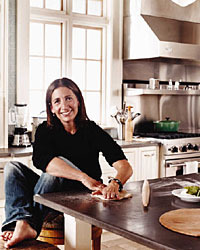 In her private life Brown takes the same approachhealthy and natural, without fuss or hasslein cooking and entertaining. Sometimes it seems as though there's a direct two-way route between Brown's office and her kitchen. For instance, she came up with the idea for her best-selling Lip Tints while watching two of her sons, then four and two, eating Popsicles. "One was eating a cherry one, and the other was eating an orange one," she says, recalling the glossy, ruddy color of their mouths. "I thought, Oh, my God, that's so cool." Today her cosmetics and skin-care products use ingredients and colors straight from the pantry: The moisturizer Extra Face Oil contains olive oil; her brown eye shadows were inspired by bars of chocolate; twist up one of her lipsticks and out comes a bullet of, say, mango or wine; and a new nail polish approximates the hue of a perfect vine-ripened tomato (not the mealy, bioengineered kind). Brown shops at least three times a week for organic produce and meat at the farmers' market, Whole Foods and other merchants in her Montclair, New Jersey, neighborhood. "When you buy healthy fresh food, it doesn't last," she says. She keeps a shopping list that's at least four pages long on her computer, using it to restock shelves with the right ingredients for her daily diet. "What I've found is that I look and feel my best when I'm really following the things I believe inexercising, drinking a ton of water, eating mostly vegetables, a small amount of fruit, a small amount of whole grains, plain yogurt and lots of protein," she says. When she's making dinner for her familyher real estate-developer husband, Steven Plofker, and their three sons, ages 14, 12 and sixBrown tries to prepare simple dishes, like grilled shrimp or lentil soup with extra celery and carrots. "My kids love it," she says. "I'll do anything to get them to eat vegetables." Brown is far stricter with her own diet than she is with her kids': A bit of bittersweet chocolate is one of the few indulgences she allows herself. Her kids like Oreos, so she compromises by keeping Paul Newman's organic version of the cookies on hand. She'll buy fresh dough from a local pizza parlor to make pies with her sons in their outdoor pizza oven (when she can pry them away from their microwavable Hot Pockets). And once a week the family orders Chinese takeout; Brown keeps it healthy for herself and sticks with steamed chicken and broccoli, which she eats with a dipping sauce of soy and hot mustard. Brown and her family throw four big parties a year, including a 12-brisket Yom Kippur break-the-fast dinner for a hundred and the occasional one-off, like the fund-raising dinner she gave for John Edwards last year. This summer she had a Tuscan-themed seated dinner party for 42, all outside in the formal garden behind her 1915 Craftsman house. Her children and their friends, dressed in black polo shirts and khakis, served the meal that Brown and her husband had made: gazpacho, to start; a simple green salad with her preferred summer dressing of olive oil whisked with lemon juice, salt and pepper; and pasta tossed with asparagus and grilled shrimp. "I'm good at feeding a lot of people and still making everything nice," she says. Brown belongs to two dinner clubs as well. Each is made up of longtime friends, meets four times a year, rotates from house to house and usually has a country as the theme. Last time Brown hosted, she chose Russia, and the members are still talking about the vodka, the caviar and the mushroom-barley soup. Brown keeps her home well-equipped for such gatherings. The 500-square-foot kitchen, with its enormous center island and bone-china-colored cabinets (more kid-friendly than stark white), contains a Viking Professional six-burner gas stove and a two-door, glass-front, stainless steel Traulsen, one of three refrigerators in the house. In cupboards above the wet bar, Brown stores more than a hundred small glasses (some of which date back to her husband's bar mitzvah) next to a growing collection of Riedel crystal wineglasses, which her mother-in-law adds to every year. Beneath the glasses, she keeps stacks of plain white plates she buys for $2 apiece at restaurant supply stores on Manhattan's Lower East Side. When Brown threw a baby shower for someone at the office recently, she broke out the Christofle flatware and her assortment of teacups, a few of which match. "I'm obsessed with anything English," she says of her ersatz collection, "but I've picked up a lot of the cups at Linens 'n Things and Wal-Mart." Inspired by her recently renovated kitchen, Brown decided to take six two-hour cooking lessons to learn basics (such as how to properly cook garlic and the right temperature for searing fish) that give her a better foundation for her instinctive style of cooking. "I don't consider myself a chef-cook," she says. "And I rarely follow a recipe. I couldn't read an instruction manual to save my life. So I have these cookbooks that are really visual." She looks for photos of beautiful dishes in favorite books like Jamie Oliver's Jamie's Kitchen and The Naked Chefsay, a shaved fennel and radish salad dressed lightly in lemon and olive oilthen replicates them by sight. She turns to Ina Garten's The Barefoot Contessa Cookbook for a chunky guacamole. "I just open my drawers and cabinets and cook. Sometimes it comes out okay, and sometimes it doesn't come out okay." And sometimes there are happy accidents. The other day the Traulsen broke. It was a financial nightmare, for one thing, since repair costs rival those for a Jaguar, but it's also a small household disaster because the refrigerator holds so many perishables. But Brown didn't panic. She started cooking. "I didn't know what I was making," she says. She put some onion in a skillet and added garlic, two chopped red peppers and some vegetable broth. "I didn't know what else I was going to do, so I thought, Let's stop and think. The blender! I blended it, then added a dollop of plain Greek yogurt, chives, pepper, and oh, my God, it was such a good red pepper soup." Cooking is one of Brown's few hobbies. "I just find it totally relaxing," she says. "Plus, you have a result when you're finished, something to eat and to share. I am a nurturerthat's just who I am." Christian L. Wright is a senior editor at Tracks and has written for New York, Travel + Leisure and Allure. This is her first piece for F&W.